As promised – here’s a fun tutorial that is great for any time of year and many occasions-including valentines day. Think of all the fun you could have with the notes or “fortune” inside – leave a love note, send to a friend, party favors, reveal you are pregnant, business thank you’s or favors and the list could go on and on SO let’s get started!!! 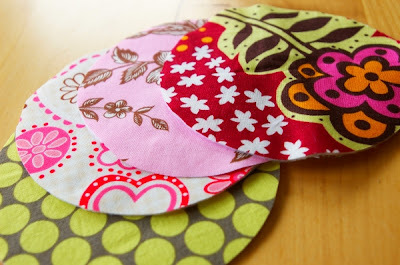 STEP 4: Trace your pattern on the wrong side of your fused fabric using a fabric marker and cut out your circles. It’s always a good idea when making several to fuse all your fabrics, trace and cut them all at once instead of doing each step individually. 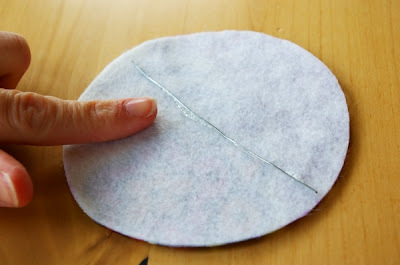 STEP 5: Cut a piece of wire just slightly shorter than the width of your circle- You can use floral wire or I just like to use whatever I have on hand that will work. For this project I used some 22 gauge wire that I had handy. Leave a small margin of space on each end. Glue in place with Craft Glue, hot glue, E6000. Again, I used what I had on hand. I believe there are several type of glue that will work. 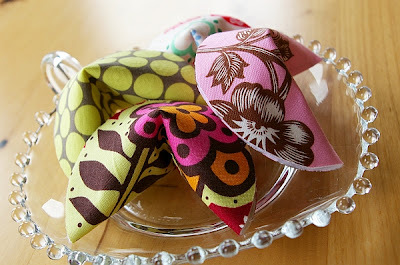 STEP 6: Cut a piece of coordinating ribbon – match the color of the inside. In this case mine is white – and glue it over the top of the wire. 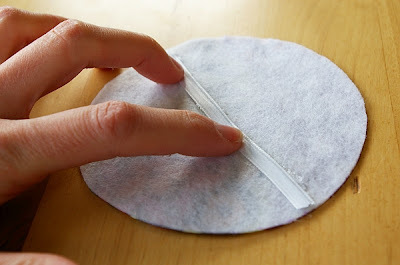 Let dry flat for 10 – 30 mins. Depending on what type of glue you used. STEP 7: While your glue is drying print off your word strips on whatever color paper you would like. 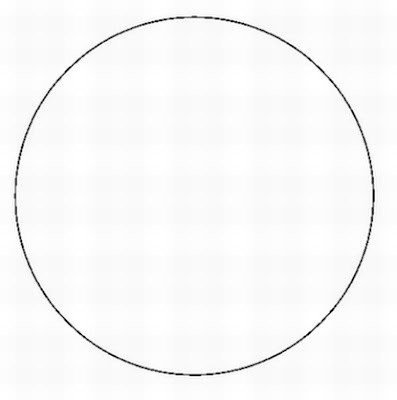 Have fun with the font, size and you could even print off several different phrases depending on what the occasion is. Cut your strips. 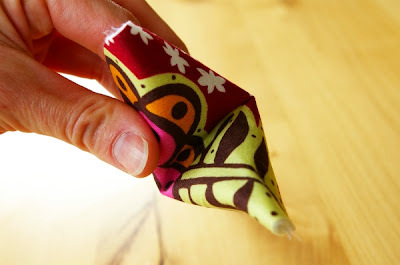 STEP 8: Once the glue is dry it’s time to fold! 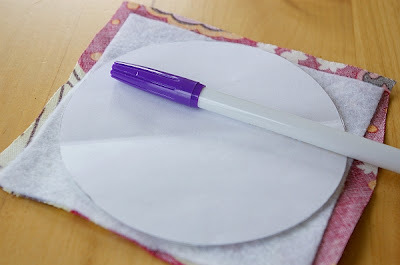 Place your word strip in the middle of the “cookie” on top of the ribbon and fold the two ends up as shown in the photo. STEP 10: This is what I call the fluff and shape step. 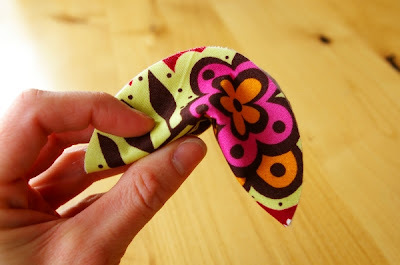 To help your fortune cookie have a natural “round” shape slip your finger in the middle and push out the sides, make sure there is a good “crease” down the middle like the photo below. This will help shape your cookie too. STEP 11: You’re done! Package them up however you would like and deliver! There are several creative ways to package these, design and give them so have fun! Enjoy! 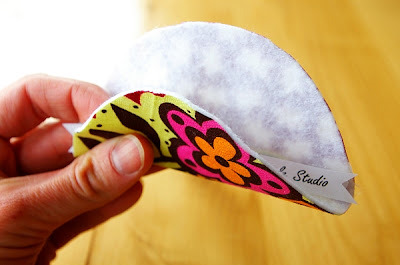 **thanks to the CRAFT blog for featuring my tutorial! smooches! It’s a good thing! Thanks Martha! fun tutorial, thanks for posting it! I love them! I am going to try some and post my pics when I do. 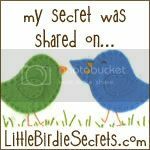 Have fun and be sure to let me know if you share photos on your blogs! Love this, it’s super cute! Love it! and it looks so easy!!! Good idea. They are so cute. Martha Stewart made these exactly the same way this past week on her show. Yup she has the tutorial in this months Martha Stewart living magazine too, she used felt though. I saw this in Martha Stewart Magazine too…. Thanks so much for the GREAT idea! The instant I read your tutorial I rummaged through my stash, found some terrific red and white flannel toile and made VALENTINE fortune cookies! My good “fortune” to make them for someone special! I will send a photo when I have an extra minute! Thanks again! great stuff! I love the patterned fabrics! fabulous! love your choices and your tutorial! Very cute idea. I will definitely try this. that is so cute, i’ll have to try that! Can’t wait to try this project. My kiddos will love it. It would make a neat business card alternative. Think I’ll have to make some to give to my bff who is starting her own business. Thanks! wonderful Jubilee! there are so many alternatives! my daughter just attended a “shanghi shindig” birthday party this weekend and instead of signing a card we slipped in fortune cookie with a note in it. they loved it!!! As a gift, these would make awesome drink coasters after the notes have been read. this is such a great idea for a party favor! In love! I am IN LOVE!!! These are awesome and I simply must find a way to incorporate them into my lfie! In LOVE! What a fab idea! I esp. 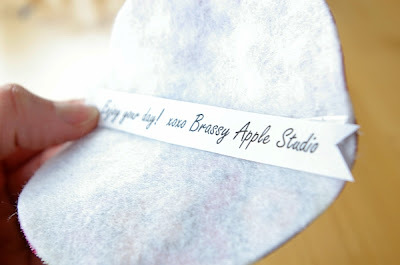 like the idea of a Valentine inside! Or maybe one could make a whole bowl of “affermantions” and give to a friend who is struggling. Maybe on your dessert plate at a dinner party, wedding, wishes from the bride and groom. So many things come to mind. Bravo! I just got back from the store and got the supplies to make these. I am putting them in Chinese take-out boxes (along with other goodies) for my kids just like on Olabelhe. I also got Valentine fabric and am making these for my daughters’ classes. Thanks! Great idea. Thanks for the tutorial. These would make great favors for any occasion. Love ’em! Used them to distribute “Will You Be My Bridesmaid?” notes! got so caught up in the “fold and fluff” step that I forgot what fortune cookies actually were supposed to look like… thank goodness for carry-out! These are wonderful! 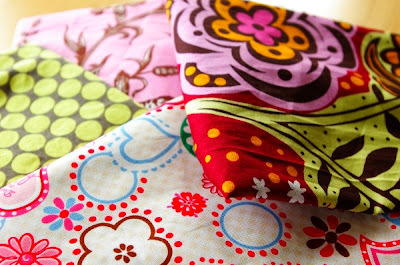 May I ask, what is the adorable fabric you used in the sample photo — the one with the red background and pink and orange flowers? It would be lovely in my daughter’s room… thanks! I LOVE this idea! We’re having an asian themed wedding this july and I’m making these as favors! I’ve already started since I’ll need like 150 (yikes haha) I’ll be sure to post pictures of the finished projects! Fab tutorial! We’ll be featuring this on OffbeatBride.com! Thanks. These are absolutely adorable and a great idea for many occassions! I love them! Beautiful and simple – gonna use it for the bridal shower i’m throwing for a friend – she will love it!! Thanks!! I just made a set out of Valentine style fabric for my husband. Inside I put “coupons” in the form of fortunes for him – Your back will be rubbed after you’ve had a hard day at work. I can’t wait to give them to him. Just made these with college fabric of the school my nephew will attend in the fall. Stuffed with Bible verses and money. Plan to make some larger ones to old gift cards to restaurants in his new town. Very fun. Loved making them. Hot glued the wire and the ribbon and it was ready in a flash. Very nice and good idea i love it. Thanks for sharing and keep posting. Okay one question, after you place the “fortune” inside, before you are bending it keep its fortune cookie shape, do you glue the top?? thanks for the great idea and tutorial. I used these for a lesson I taught today! 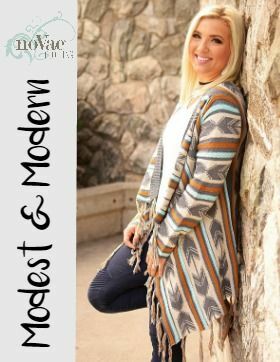 I’m adding your link to my blog post!! I was wondering, since you’re using the fusible fabric… why include the ribbon step at all? Why not fuse the wire in place as you iron? Seems like a really cute craft project, been toying with trying this idea using polymer clay for some time now. 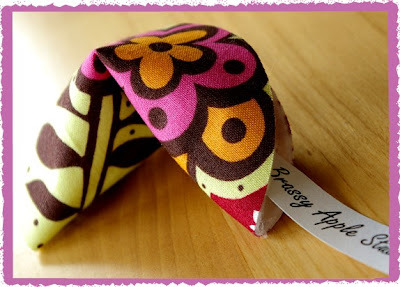 Hi Megan – saw this cute project on a sewing site and thought I’d pop in and say hi. We were in a fashion show together, oh years ago, for Alicia Richmond. I wanted to tell you how much I love a shirt I bought from you. I have that “Have courage and be kind” shirt in black. It’s one of my favorite tops and I always get a TON of compliments on it when I wear it.